We’d be grateful if you could let us know the best time to reach you, so please drop us an email with some suggested times. Based on the information you have provided, the next step will be for our adviser to obtain the most relevant and competitive quotes from a number of insurers. Our Hartsfield adviser will then give you a call to discuss at a convenient time for you. Based on the information you have provided, the next step will be for our adviser to obtain the most relevant and competitive quotes from a number of insurers. Your adviser will then give you a call to discuss within one working day. With income protection, there are a number of variables which can significantly impact your quote. Our adviser will talk you through the effects of amending your criteria to end up with a quote which balances your insurance need and your budget. Following the call, our adviser will put a no-obligation quote in writing to you and also explain your options for how we can put your cover in place when you’re happy to proceed. We can help complete the application online with you and liaise with the underwriters, to help you through the process every step of the way. You want to take steps to protect yourself and your family, so that if something happens to you, they are looked after. 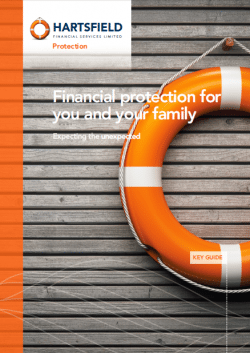 Download this FREE guide which set out the basics of financial protection. Need2Cover is a trading style of Hartsfield Financial Services Limited which is authorised and regulated by the Financial Conduct Authority (FCA) and is entered on the FCA register under reference 615731. Information about the Financial Ombudsman Service (FOS) is available from their website here. The information contained within this website is subject to the UK regulatory regime and is therefore primarily targeted at consumers based in the UK. The Financial Conduct Authority does not regulate Inheritance Tax Advice.